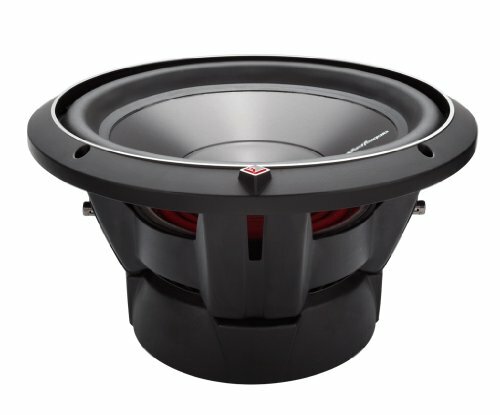 If you’re looking for a way to seriously juice up the “thump” in the trunk without blowing your money on crappy subwoofers, this page is for you. Whether you’re looking for a casual hitter, a upgrade from your existing subwoofer, or maybe you want competition level performer. Here, we’re going to cover the best subwoofers to get for ANY kind of budget and stereo system. But before we do that, you first need to decide what size of subwoofers you’ll be looking for: 8-inch subwoofers, 10-inch subwoofers, 12-inch subwoofers, or a whopping 15-inch subwoofer. For each type of subwoofer you’ll need to look into a different sized boxes, as each woofer may require a particular size to produced desired sound. So, let us dive into the top 10 subwoofer reviews! When we looked at what which subwoofers to put in our top 10 list, we came up with over 25. But of course we had no narrow it down, and lucky #10 is the Kenwood KFC-W3013PS Performance Series 12 inch subwoofer. This one is a single coil running at 4-ohms. A very nice budget friendly woofer, maxing out at 1200 watt amps and about 450 watt amps RMS. The woofers surroundings are made of rubber,as well as the entire woofer cone made of polypropylene. It’s important to note with this woofer that you NEED to pick the right sized box, as well as not to underpower it. Comfortably, you can be pushing 450 to 500 watts RMS. As long as you have a good amp and box setup, this will be a very cost effective subwoofer (comparable to more expensive models). Moving down to a much more casual subwoofer, Polk Audio DB1040 is perfect for a non-violent sound system. At 10″ inches in size, this subwoofer hits plenty hard for the money. Compare it to its rivals, and in most cases the decision would be with this subwoofer. This particular woofer has a single voice coil, equipped with a black dynamic balance polymer composite cone. Frequency response is between 28 and 200 Hz. Peak handling power is rated at around 540-watt amps, while the constant running power is at 270-watt amps RMS. What 55 dollars gets you are darn good starter subwoofers. While definitely not the hardest hitting speakers you’ll come into contact with, they are by no means weak. When not being overpowered, this Polk Audio subwoofer produced deep, but clean bass to compliment your car’s speakers. Many would define these this one as the sister subwoofer of the Alpine Type-R. Costing a noticeably lesser amount is the Alpine SWS-12D4 12 inch subwoofer. Running at 4 ohms, 1,500 peak watts and 500 watts RMS, the kevlar reinforced cone allows for MORE hard hitting abuse than a subwoofer without kevlar. It’s aluminum frame give it stability but not much weight, at just 14 lbs in total. We recommend hooking this subwoofer up to the Alpine MRV-M500 mono amplifier to bring out its real potential. As we mentioned about the 500 watts RMS and 1,500 watts MAX, it’s all possible due to the voice coils, which Alpine says are 6-layer and wound on a spiral-cut aluminum former. Infinity Reference makes some pretty cheap audio equipment, from car component speakers to their subwoofers. Taking our #7 spot is the Infinity Reference 1262w 12″ inch High-Performance subwoofer. What makes this subwoofer stand out for us is the price, and power output it provides. Starting off with the maximum power output, this subwoofer’s dual voice coil pushes 1,200 watts, as for RMS it pushes out 300 watts. Frequency response ranges from 23 Hz to 400 Hz and sensitivity of approximately 93 dB. Ideal sealed box volume Infinity recommends to be at least 1.25 cubic ft, as por porter they recommend at least 2.0 cubic feet. When powered adequately and placed in a decent sized box, this 60 dollar subwoofer will impress you. Currently, over 230 individual user reviews have given it a 4.5 star rating as an average. Check it out for yourself. Currently, over 230 individual user reviews have given it a 4.5 star rating as an average. Check it out for yourself. Moving on the a slightly more competition grade subwoofer, the Kicker 40CWR122 12 inch 2-ohm subwoofer comes in as number 6. For starters, the Kicker 40CWR122 is rated at handling 1,000-watt amps and nearly 500 watts are RMS (although some have claimed 800 watts RMS). The rubber surround, injection-molded polypropylene cone and a frequency response of 25 to 50 Hz give it deep hitting bass (given that you provide an adequate box and amplifier). Recommended space for sealed box is between 1.0 to 4.6 cubic feet and ported box is between 1.75 cubic feet and 2.25 cubic feet. As some have stated, if you want to keep your rear-view mirror…. don’t get one of these. In conclusion, for around 100 dollars, the value is decent and performance is right where it should be. You’ve seen hard-hitting subwoofers in some expensive audio setups, JL is one of those brands that delivers an impressive, hard-hitting result. Our #5 contestant is JL Audio’s 12W3V3-4 4-Ohm subwoofer. This one in particular is capable of running 1,000-watt amps MAX power, and around 500-watt amps of RMS (consistent power). Being 12″ inches in diameter gives it more of a punch than an 8″ or 10″ inch subwoofer. The recommended size of your box for sealed should be 1.125 cubic feet and for your ported box, it should be around 1.75 cubic feet. If shopping for premium brands, JL Audio is definitely one of those. Priced relatively steep, there’s a few comparable woofers that cost considerably less. However, here you’re getting JL Audio build quality so the decision is yours. Not many can argue that the Alpine Type R, is one of “those” subwoofers that BIG thumping sound systems typically have. Just a step below its big brother, Type-X, this 12″ 2 Ohm subwoofer is enough to rattle every part of your vehicle with no trouble at all, seriously. At the peak points of this subwoofers potential, it’s 3,000 watt amps MAX and on the RMS side it’s right around 1,000 watt amps. To handle this kind of power, you’d probably assume there’s some kind of reinforced parabolic cone structure, well you’re correct. The cast aluminum frame gives it durability without compromising too much on the weight. Sound sensitivity is around 84.7 dB and frequency response is between 24 and 200 Hz. Lastly, to get the optimal sound we recommend you get the following sizes for your box: .75 to 1.00 cubic feet for sealed and 1.25-1.50 cubic feet for ported. Price is very reasonable, and in most cases just one subwoofer will “shake” the entire vehicle. 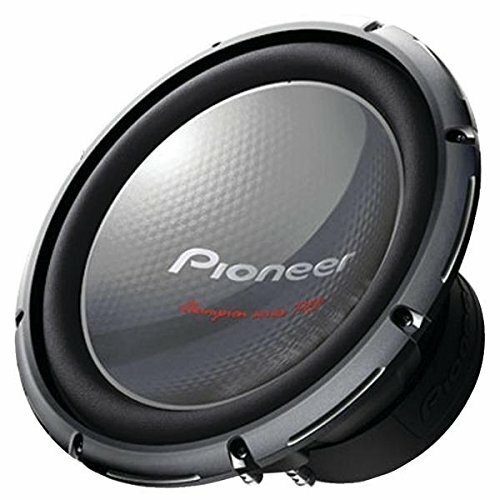 A bit down in power when compared to the Type-R but much more affordable, we have the Kicker 10CVR124 12″ 4 Ohm subwoofer. Reinforced with an injection-molded polypropylene cone and surrounded by Santoprene rubber, this subwoofer is capable of punching briefs bass notes at 800 watts MAX and around 400 watts RMS consistently. Frequency response rates are between 25 and 500 Hz ( a considerable jump from the other subwoofers we reviewed), sound and volume sensitivity is right around 86.9 dB. From countless user feedback, this particular model by Kicker hits very hard. We highly recommend using a mono amplifier rated between 300 and 600 watts RMS at 2 ohms. Moving down to a true competition grade subwoofer is Pioneer’s TS-W3003D4 12 inch Champion Series Pro. Producing chest pounding bass, this rugged subwoofer handles up to 600 watts RMS without breaking a sweat. There’s versatility of dual 4-ohm voice coils, and for this subwoofer to be in either a sealed OR ported box. To get the absolute best performance, Pioneer recommends using a 0.85 cubic feet sealed box OR, a 1.75 cubic feet ported box. Run an amplifier from anywhere between 450 and 900 watts at 2 ohms. So if you just read through our previous 9 subwoofers, then you probably have been waiting to see who is number one… Our #1 best subwoofer for cars and trucks is the Rockford Fosgate P3D5-12 12″ subwoofer. First off, you’ll see this model is not only epic in performance, but also has an overwhelmingly positive feedback chain. From over 200 individual user reviews, it receives an average of 4.8 stars from 5. Rated at around 1,200 peak watts and 600 RMS watts, this subwoofers aluminum cone frame acts like a giant heat sink, directing heat away from the copper-clad aluminum coils. 25% more surrounding rubber attached to the cone helps to move more air (around 25% more), as a result helping to increase bass levels. In terms of box size, Rockford Fosgate recommends having 0.75-1.25 cubic feet of space for sealed box, and 1.79 cubic feet of space in a ported box. As far as amplifier wattage, ideal power should be 450-900 watts RMS at 2ohms. Some additional things you should keep in mind and possibly upgrade if you can are, your starter battery and music head unit. First off, having a car battery that cranks over fast and can handle a HEAVY HITTING subwoofer will help you avoid unnecessary jump starts. Having a head unit that has various settings to tune the subwoofer WHILE it’s playing, allows you to play the speaker at frequencies that sound best.